Analysis: This news comes on the heels of the 49ers stamping the franchise tag on Gould on Feb. 26. San Francisco presumably hopes to come to terms on a multi-year contract after Gould converted 96 percent of his field-goal attempts and 93.2 percent of his PATs through his first two seasons with the team. Analysis: Gould did all the scoring for the 49ers in a tough matchup against a stout Chicago defense. The long-time Bear upped his field-goal conversion rate to 97 percent (32 of 33), which would be the best mark of his career (minimum of 20 attempts) if the season ended today. Alas, it does not, and Gould will look to cap off his impressive season in Week 17's matchup against the Rams. Analysis: The 49ers were firing on all cylinders in an impressive upset victory, resulting in Gould's biggest scoring output (14 points) this season. 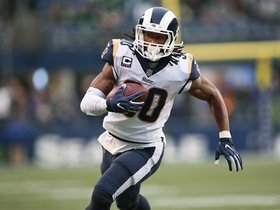 The veteran remains one of the most accurate legs in fantasy, but a rough matchup against Chicago looms in Week 16, which could hinder his scoring opportunities. Gould nailed both of his field-goal attempts (28, 40) and made both point-after tries in Sunday's 20-14 win over the Broncos. Analysis: San Francisco's offense rebounded in a rare win, resulting in Gould's first multi-score game since Week 10. The veteran has a decent floor due to his elite accuracy (96 percent on field goals this year), and there is potential for more if the 49ers can take advantage of a middle-of-the-road Seattle defense in Week 15. Gould nailed his only field-goal attempt from 45 yard and also chipped in a point-after try in Sunday's 43-16 loss to Seattle. Analysis: The 49ers' offense posted 452 total yards, but the team fell behind early on, eliminating any potential for second-half field goals for Gould. The veteran kicker has accrued just seven points over the last two games, making him a low-end option against the Broncos on Sunday. Gould kicked a 23-yard field goal, but missed his lone extra-point attempt in Sunday's 27-9 loss to the Buccaneers. Analysis: The usually accurate Gould uncharacteristically missed his second PAT of the season, and he has now missed more extra-point tries (19 of 21) than field-goal attempts (22 of 23) in 2018. 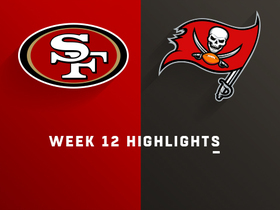 The 49ers' offense sputtered under Nick Mullens in what should have been a soft matchup against the Bucs' defense, which clouds Gould's fantasy prospects for the Week 13 matchup against the Seahawks. Gould went 3-for-3 on field-goal attempts (30, 36, 53) and converted both point-after tries in Monday's 27-23 loss to the Giants. Analysis: The sure-footed kicker reached double-digit points for the second consecutive week, taking advantage of another soft matchup against the Giants. The 49ers are entering their bye week, so Gould could be widely available in another prime matchup against the Buccaneers' soft defense in Week 12. Gould nailed both of his field-goal attempts (from 25 and 39 yards) and converted all four point-after tries in Thursday's 34-3 win over the Raiders. Analysis: Gould actually would have had a third successful field goad had a defensive penalty not erased the points. The 49ers' offense showed renewed life under quarterback Nick Mullens, who was making his first NFL start. Whether it's Mullens or C.J. Beathard that receives the nod under center in Week 10, Gould could be primed for another strong performance against a reeling Giants squad. Gould converted both his field-goal attempts (20, 27) and his lone extra-point try in Sunday's 18-15 loss to Arizona. Analysis: Gould wasn't challenged Sunday, with his longest attempt being a PAT on the 49ers' lone touchdown. The veteran could be in line for a larger workload in a favorable matchup against the Raiders on Thursday Night Football. Gould nailed his only field-goal attempt from 51 yards out, adding a successful PAT in Sunday's 39-10 loss to the Rams. 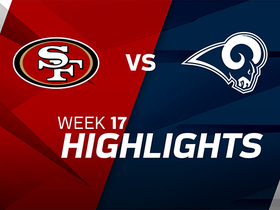 Analysis: The 49ers' offense was unable to get anything going against the Rams' defense, resulting in limited use for the veteran kicker. Gould's lone field goal came from 50-plus yards, his first attempt from that range this season. San Francisco's offense will look to get back on track against the Cardinals on Sunday. Gould nailed all three of his field-goal attempts (43, 44, 46) and went 3-for-3 on extra-point tries in Monday's 33-30 loss to Green Bay. Analysis: Gould bounced back in a big way after missing his lone field-goal attempt last week against the Cardinals. The 35-year-old is now 13-for-14 (93 percent) on field-goal tries this season. The 49ers offense has looked surprisingly dynamic under backup quarterback C.J. Beathard over the last three weeks, which bodes well for Gould's prospects as a fantasy option moving forward. Gould pushed his lone field-goal attempt wide right in Sunday's 28-18 loss to the Cardinals. Analysis: Gould's miss came from 45 yards out, breaking a team-record streak of 33 consecutive successful field-goal attempts. The 49ers were forced to go for two on their final two touchdown drives after a botched snap and hold forced punter Bradley Pinion to fall on their first extra-point attempt. Chalk this up to a rough day for the entire kicking unit. Gould is still 10-for-11 on field-goal attempts this season heading into a Week 6 matchup against the Packers. Gould went 2-for-2 on field-goal attempts Sunday, also chipping in three PATs in a 29-27 loss to San Diego. Analysis: Both of Gould's field goals were chip shots (21 and 33 yards), resulting in a relatively easy day for the sure-footed kicker. Backup quarterback C.J. Beathard surprisingly kept the offense moving, which bodes well for Gould's prospects in the wake of Jimmy Garoppolo's (knee) season-ending injury. Gould stayed perfect on both of his field-goal attempts, but he did go 1-for-2 on point-after tries in Sunday's 38-27 loss to the Chiefs. Analysis: The sure-footed Gould uncharacteristically doinked an extra-point try off the right goal post, but otherwise turned in another solid fantasy performance. 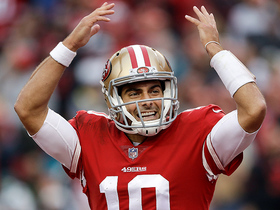 Jimmy Garoppolo went down with what is being feared as a season-ending injury, and that is a cause for concern regarding the veteran kicker's value. Gould only converted seven field goals over six games with C.J. Beathard under center last season. Gould went 3-for-3 on field-goal attempts (36, 42, 45) while connecting on all three point-after tries in Sunday's 30-27 win over Detroit. 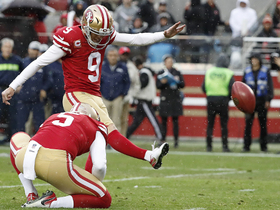 Analysis: Gould's second field goal was his 28th consecutive successful attempt, setting a new club record for the 49ers. The veteran leg is now a perfect 6-for-6 this season, proving to be one of the more accurate kickers in the league. Gould converted all three field-goal attempts (22, 33, 42) and added a PAT in Sunday's 24-16 loss to Minnesota. Analysis: Gould carried over his success from last season (39-for-41 on field-goal attempts) with a perfect start to the 2018 campaign. 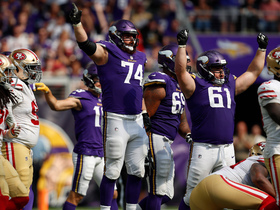 The 49ers' offense moved the ball relatively well between the 20s against a stout Vikings D, but it sputtered in the red zone. If this trend continues, Gould could be in for a strong fantasy season from a volume standpoint. Gould was a perfect three for three on field-goal attempts in Saturday's preseason loss to the Colts. Analysis: Gould looked to be in midseason form for the 49ers' "dress rehearsal" Saturday. 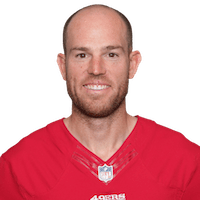 The 35-year-old looked rejuvenated after joining San Francisco last season, going 39 for 41 (95 percent) on field goal attempts, including a perfect four for four from more than 50 yards. Gould should be a serviceable fantasy kicking option with the offense expected to take a step forward under Jimmy Garoppolo this year. Gould said the 49ers' locker room is "probably the best" he's ever been a part of in the NFL, Eric Branch of The San Francisco Chronicle reports. Gould converted both of his field-goal attempts (33, 48) and all four PATs in Sunday's 34-13 win over the Rams. Gould made a 27-yard field goal but missed one of his six extra-point tries in Sunday's 44-33 win over the Jaguars. Analysis: Gould's missed extra point was just the fourth time he's misfired on 65 total attempts this season. The reliable veteran has tallied 56 points over the past four games, moving him into fourth league-wide in scoring. Gould was perfect on all six of his field-goal attempts Sunday, adding an extra point in a 25-23 win over the Titans. Gould made field goals from 52, 35, 25 and 41 yards in Sunday's 26-16 win over the Texans, when he also made both his extra-point tries. Analysis: Gould has now notched 29 points in two games since Jimmy Garoppolo took over as San Francisco's starting quarterback. While it remains to be seen whether his production increase continues, that's the best two-week stretch Gould has put together this season. 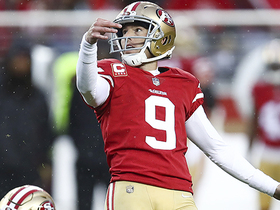 Gould went 5-for-5 on field-goal attempts Sunday, accounting for all 15 of the 49ers' points in a win over the Bears. Gould was good from 38 and 42 yards out on his two field-goal attempts Sunday, adding an extra point in a 24-13 loss to Seattle. Gould nailed a 43-yard field goal and converted all four of his extra-point attempts in Sunday's 31-21 win over the Giants. Analysis: It was a rare sight to see the 49ers move the ball at will against an opponent for a change, and while it didn't result in more field goals for the veteran, he was able to reward fantasy owners with four PAT conversions for the first time this season. Sunday's offensive explosion was likely the result of the Giants being one of the few teams in worse shape than the 49ers, so Gould should remain a low-end kicking option against the Seahawks following the team's bye week. Gould made his only field-goal attempt from 42 yards out and converted an extra-point try in Sunday's 20-10 loss to the Cardinals. 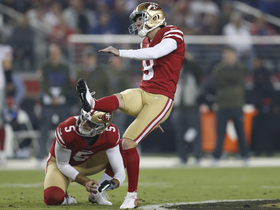 San Francisco 49ers kicker Robbie Gould makes a big 45-yard kick against the Seattle Seahawks. QB Kirk Cousins draws an offside penalty against the San Francisco 49ers defense in a critical moment. 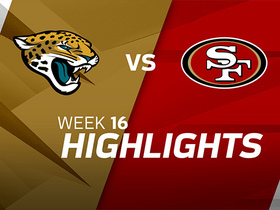 Check out every score by the San Francisco 49ers in a Week 16 win over the Jacksonville Jaguars. 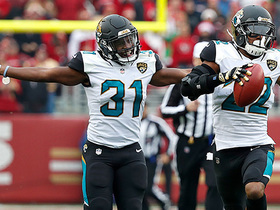 Jacksonville Jaguars cornerback Jalen Myrick blocks a PAT attempt by the San Francisco 49ers and returns it all the way for 2 points for the Jaguars. The "Good Morning Football" crew reveals the NFL Players of the Week for Week 15.